James or Jamie, as he likes to be called is a 48-year-old general builder who spent most of his working life building and maintaining properties. In 2013 he started to experience twitches and pains in his hands and arms, but he put this down to stress and continued working as normal. Later in 2013 Jamie was walking to collect his daughters when his legs gave way and he fell to the floor. It was then that Jamie realised something was wrong and booked a doctor’s appointment. The doctor sent Jamie for tests and it was initially thought that he had carpel tunnel syndrome. But the ongoing loss of use of both his legs and hands was starting to have a major impact. After several months of really struggling to get around and manage his business and with no proper diagnosis from the hospital, Sarah, his partner suggested that they book a private consultation which was in October 2014. 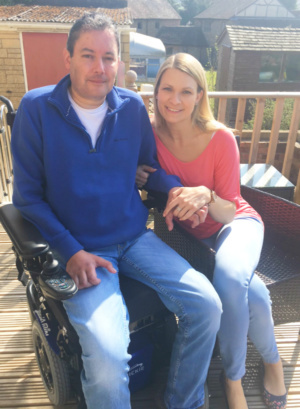 Jamie says, “As soon as the consultant shook my hand, he suspected what was wrong and after further investigations, I was given the devastating news that I had motor neurone disease and that my life expectancy was three years”. Jamie does not remember much of that day, but he does remember having to walk down the corridor to Sarah who had been waiting outside for him and tell her the news. “It was the longest walk of my life”, says Jamie. Jamie had to stop work two months later and since that day his condition has worsened. He is now severely disabled, permanently uses a motorised wheelchair and must always be accompanied in case he falls out. He also has very limited use of his hands and is unable to lay down without being connected to oxygen otherwise he will stop breathing. In 2015 and after much soul searching, Jamie and Sarah decided to try for a baby. This was a difficult decision but they felt that had seen so much tragedy they simply wanted to bring some joy to their lives. Jamie already had two daughters from a previous relationship who he and Sarah have a very strong relationship, but Sarah had never had a child and the plan had always been to start a family together. Two years ago, their son was born and Jamie says, “If it wasn’t for my family, I truly believe I would have given up on life and it’s them that keeps me going”. Jamie and Sarah added, “We heard about the Lighthouse Club Charity through our local hospice. We have never asked for help before, we’ve always just gone through life trying to make the best of everything and still do, but the money that the Lighthouse Club Charity has given us has made an enormous difference to us. It is taking a lot of the stress and worry away from everyday life and means that we can focus on family life. Thank you from us all”. Times are hard for this family and will continue to be so. Jamie does not want much, just to see his family grow and prosper into adulthood and he hopes that he will be around long enough to see this. Watch our short video below and hear the full story, told by Jamie himself. If you’d like to know more about how you can support our work and help people like Jamie, visit our Support Us page.